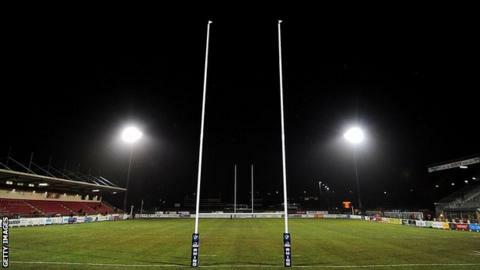 Plymouth Albion's coaching staff have resigned in the wake of the sacking of director of rugby Graham Dawe. Assistant coach Simon Lane and performance coaches Tristan Lark and Lee Jago have stepped down. It means that Exeter Chiefs academy coaches Rob Gibson and Sam Morton will be in sole charge for the final two games of the season. The duo were brought in to help with the side following Dawe's departure on Monday by the club's new owners. Neither Venables or Priday have made themselves available for interview since taking over the club. "The news about Graham was announced on Monday and things changed," said Lane in a statement. "There was also the influx of the two new guys from Exeter. If they hadn't brought anyone in and the lads still needed someone for the last two games, then I would have stayed for them and Graham would have wanted that. "But to bring those two guys in from Exeter changed things. If there was 10 games left or if there was a promotion or relegation battle going on then you could understand that, but for the sake of two games it is just such a strange decision. "There is no evident reason why Graham couldn't have at least gone through to the end of the season after all the effort he has put in. "After everything that has gone into this season that, in all people's minds, would have been the decent thing to do. "After working with Graham all year, I would have liked to have finished the season as well," he added.